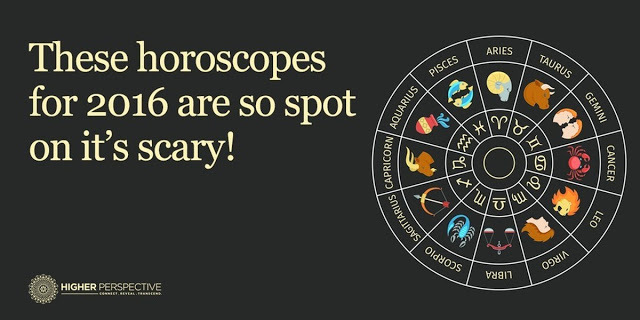 These 2016 Horoscopes Are So Accurate It's Scary! 2016 is the year for Aries to take control of their image. Of course, the plan for this to take a lot of effort. Your image could be the way you physically look or the way people perceive you as a person. Respect physical limits, don't hurt yourself, and keep your chin up. This is a positive change! 2016 will be a big year for changes for Taurus. This is a great year to reinvent yourself, the way you live, and what it is that you do. Even if you don't opt to change anything, it'll likely happen anyway. Do things at your own pace, feel no pressure, and remember that people love you. Gemini should see 2016 as the year they rise. Keep a constant effort at doing your best and never back down. Keep your eye on the prize and stay focused at all times. Remember to live peacefully at home and do good things for the world. Major changes will likely come in Autumn. Be prepared to charm the pants off people in 2016, Cancer. This is going to be a great year for making friends, reconnecting with people in meaningful ways, and maybe finding the love of your life! Stay on top of your responsibilities and try not to become too hedonistic and egotistical. 2016 will be a year of hard work and success for Leo. You'll find that your professional and social lives will thrive all year long. Around March, during the solar eclipse, you will likely experience a major shakeup of sorts. Be prepared to do what you can to make the best of it. 2016 is shaping up to be a year of big ideas, progressive and regressive depending on where you are. Focus on bringing your ideas into reality. Build coalitions to create new things. 2016 will be a comfortable year for you. 2016 will be a lucky year for Libra in more ways that one. Use your tact and social skills to demand greater satisfaction and happiness. Create opportunities for yourself to grow. In the spring, people and circumstances will surprise you. 2016 is the year for you to break down barriers you may have built up, Scorpio. Through force of will, you can make 2016 a wonderful, productive year, but you have to really work at it. You'll find in autumn your people skills will suddenly improve. You'll want to take this time to be as outgoing as possible and bring in new friends and lovers. 2016 will be the year for Sagittarius to unleash their creative talents with the world. You might find yourself becoming extra critical of your work in the spring, but don't let it slow you down. The solar eclipse in September will be a great time for you to focus on art and creativity. 2016 is the year that Capricorn will need to break out of their usual cycle and try new things. This doesn't mean you need to start jumping out of airplanes or really escaping your comfort zone, but it's a good time to begin investigating new hobbies and new fun things to do. Among them all, Aquarius is the rising star this year. A lot of your work will be cerebral, and you'll never be short a brilliant idea. Take this time to learn new things. Pick up a second language or take a class or two at the community college. Much of what Pisces accomplishes in 2016 will be with the help and cooperation of others. This may be a tougher year for you than anyone else. You'll find yourself in unfamiliar territory with perhaps some unfriendly force meeting you there. Reach out and connect with people. Forge new relationships. You'll need to power your way through this year.